Four hours later, Mar Mostro had tacked again and, such is the closeness of this race, Groupama followed five minutes later. The leading trio is now engaged in a battle as they trade tacks to clear the string of islands. Although largely flat, the islands should not present a wind shadow, although there is always the chance of fluky breeze close to the coastlines. The next hours will be very tactical and it is likely that the leading three will continue to sail as if racing inshore, looking for the layline and covering their position. Once past Selia Island, the third of three waypoints in this area, the next challenge will be a punching 450 nm one-tack beat towards the coast of Vietnam. The weather is closing in and in 30 hours’ time the fleet will be sailing in gale force conditions with waves up to five metres. Closer to the Vietnam shore, however, the wind will ease as it moves left and bends round the coastline, but it will be physically demanding on the crews as they tack and stack around the Capes, looking for an advantage, while escaping the worst of the storm. In fourth and fifth place, 30 nm behind the leaders CAMPER (Chris Nicholson/AUS) and Ian Walker’s Abu Dhabi Ocean Racing, five nm behind, have their own private match race having both turned the corner and pointed their bows towards the archipelago. 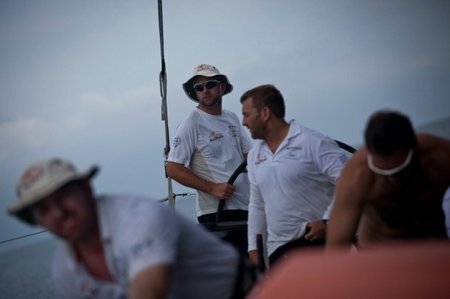 Present conditions are unpleasant with frequent rainsqualls and 14-15 knots of northeasterly breeze; a complete change from the windless heat of the Singapore Strait, which sixth placed Team Sanya (Mike Sanderson/NZL) is still negotiating. Over 176 nm in arrears, Team Sanya are crossing the worst of the commercial traffic in the Singapore Strait in daylight, having had a lucky escape from a fishing net yesterday. For those that negotiated the Strait at night, the blur of lights from the maze of shipping was a confusing, but magnificent sight. “Hundreds of 200-300-metre ships were swinging at anchor causing an abundance of commercial confusion and a buzz of constant activity,” reported Amory Ross from Mar Mostro. “All the while, the massive metropolis of Singapore loomed up river, bright enough to silhouette the surrounding aircraft carrier-sized ships,” he said of a sight, although already long forgotten by the racing crew, he will remember for years.